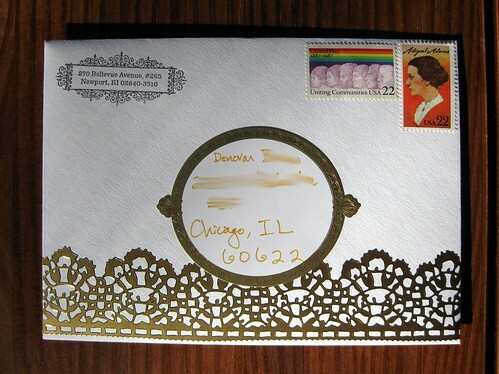 I was feeling golden in my decorative mood for a recent (well, November) letter to Donovan. I combined some large plasticky deco tape with a Martha Stewart Crafts label. I think the stationery is Crane something... it's certainly cottony. I went with a simple vintage label on the back. 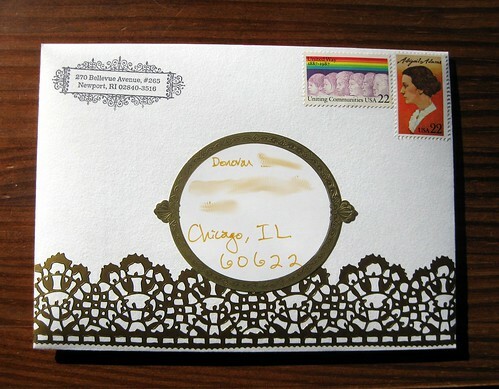 I used a couple of vintage stamps - Abigail Adams, known as a writer (corresponding with her husband, President John Adams), and that lovely rainbow-edged United Way stamp. It was lovely inside too. I like! Especially the vintage Abigail Adams stamp. And everything else Adams!! This is the first I've seen of your return address stamp, it's a 10 out of 10. I especially love that you used your full nine digit zip code. Thanks, James - I got it about a year ago and I've loved using it. I actually got another one recently from the same company - Paperwink. Highly recommended. 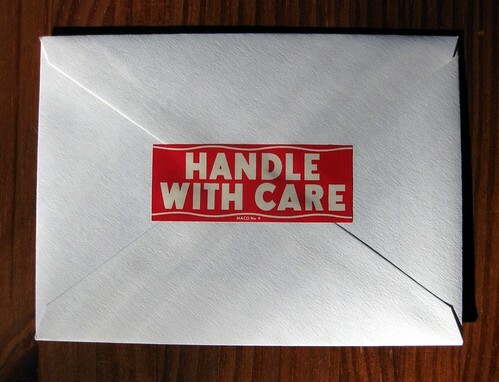 My original post about this return address stamp is here.